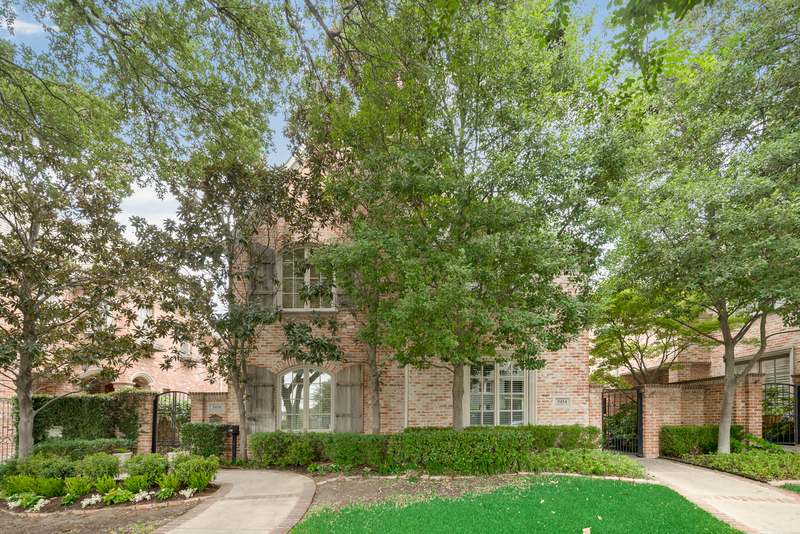 Situated in prestigious University Park across from McCulloch Middle School and also within walking distance to SMU and nearby shopping areas, 3456 Granada Avenue is a fabulous brick traditional single family attached residence, custom built with one owner, and has wonderful drive-up appeal. Details include 10’-foot ceilings downstairs, expansive entertaining rooms, handsome quarter sawn oak hardwoods, deep molding, light-filled windows, wrought iron detailing, and wonderful marble and granite finishes throughout. Exuding warm elegance with its sophisticated interiors and luxury amenities, the wonderful two-story residence offers approximately 3,502 square feet, elegant formals, including a spacious living room centered by a stunning white marble fireplace and an open dining room graced with an iron chandelier, a spacious chef’s granite island kitchen featuring richly stained Mahogany cabinetry, premier stainless steel appliances, including double Jenn-Air convection oven gas ranges, a KitchenAid refrigerator with freezer, compactor and microwave plus an LG dishwasher, two breakfast bars, a large walk-in pantry and also opens to an oversized family room showcasing a limestone fireplace, richly stained Mahogany built-ins and dual French doors opening to scenic views of an inviting patio highlighted by lush landscaping with a gorgeous Japanese maple tree overlooking a sparkling pool with waterfall and pool lighting, a fabulous temperature controlled wine room with expansive quarter sawn oak wine racks and abundant storage and French doors opening to the pool area, a 1,000-square-foot luxurious master suite with a sitting area and see-through fireplace opening to a gorgeous marble bath with His and Hers vanities, a jetted tub, separate double shower, huge walk-in closet, and an adjacent exercise-sitting room with abundant built-in bookcases, two additional generous-sized bedrooms with neutral carpeting, large closets and two elegant full baths, a fully equipped utility room, elegant powder room and a two-car garage completes this fabulous residence.